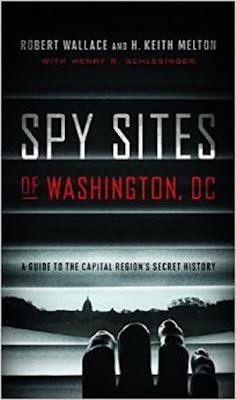 Veteran journalist and author Joseph C. Goulden offers a good review of Spy Site of Washington D.C. for the Washington Times. Let us show a bit of civic pride, if you please. As a center for spies and espionage, Washington and environs are the equal — or better — of such renowned cloak-and-dagger meccas as Vienna or Istanbul. Start at the beginning: The founding father of the American nation, George Washington, was also the founding father of American espionage, and a revered figure for following generations of spies. Readers can trust the expertise of the authors. Robert Wallace ran CIA’s Office of Technical Services, which invents spycraft equipment for communications and other covert chores. R. Keith Melton, an Annapolis graduate, owns one of the largest collections of spy artifacts in existence. Henry Schlesinger collaborated on three earlier books. 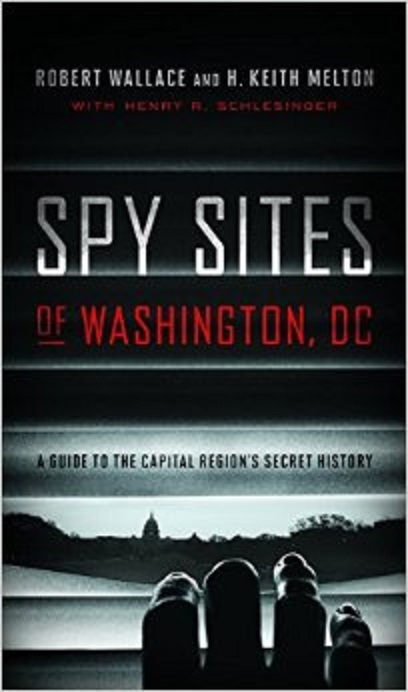 “Spy Sites” could be considered two books in one. It is a capsule history of spying in and around D.C., with crisply written profiles of the major players. Even intelligence buffs will encounter a few unfamiliar names. Consider, for instance, Thomas Atwood Digges, a Marylander who worked in London to free American sailors imprisoned by the British. Yet he was so sloppy with his accounts that Benjamin Franklin (for whom he was a sometime courier) denounced him as a rogue and scoundrel. But there is a monument to him on the Digges family estate across the Potomac from Mount Vernon. “Spy Sites” is also a guide book that should be invaluable for weeks of Sunday afternoon spy walks or drives — from downtown to tranquil suburbs. With maps and photos, it enables the reader to view the obscure dead drops that such rogues as Aldrich Ames, John Walker and Robert Hanssen used to pass secrets to the Soviets — “you are there” experiences of the first order. There are also some seldom-discussed secrets as to how FBI and other counterintelligence officers “spied on the spies.” For instance, an old grist mill built in the 1820s was converted into the Art Barn in Rock Creek Park in 1971. The “Barn” provided a showcase and free classes for artists. It was also an excellent site for eavesdropping on the nearby Hungarian and Czechoslovakian embassies. The FBI made such use of the building until a tattletale revealed the spying to The Washington Post in 1982. The disclosure, suggest the authors, was prompted by the occasional presence of clean-cut young men wearing sunglasses at the Barn — FBI agents, rather than those of CIA, which cannot operate domestically. In terms of volume, perhaps the most active periods of spying came during the Civil War and the Cold War. The authors take a justifiably critical look at the Union’s intelligence operations, which constantly made overblown “estimates” of the strength of Confederate forces. Unfortunately, many of the 19th century dwellings occupied by Confederate spies working in Washington have fallen victim to developers’ wrecking balls. But one could easily put together a “spy romance tour” based on the book. For instance, Ronald Pelton, of the National Security Agency, had money problems, so he quit his job, entered the private sector, and began selling secrets to the KGB. Part of his “pay” went to support a “former beauty queen” who lived at 1625 P Street NW, which is pictured in the book.